This is a trail on the western slopes of the Catalina Mountains below Samaniego Ridge. Most of these trails in this area are used as mountain bike trails but do see some hikers, especially as you get higher up on the slopes of Samaniego Ridge. There is a maze of trails in this area many of them are not official named routes. Signage in this area is nonexistent. This trail is entirely on State Trust land and a State Trust Land Permit may be required. I was informed by the locals that hiking in the area didn’t require a permit but parking on state Trust Land probably does. The rules for State Trust Land require that you get a permit if entering Trust Land. I went on line and got a year pass for $15.00 to be on the safe side. 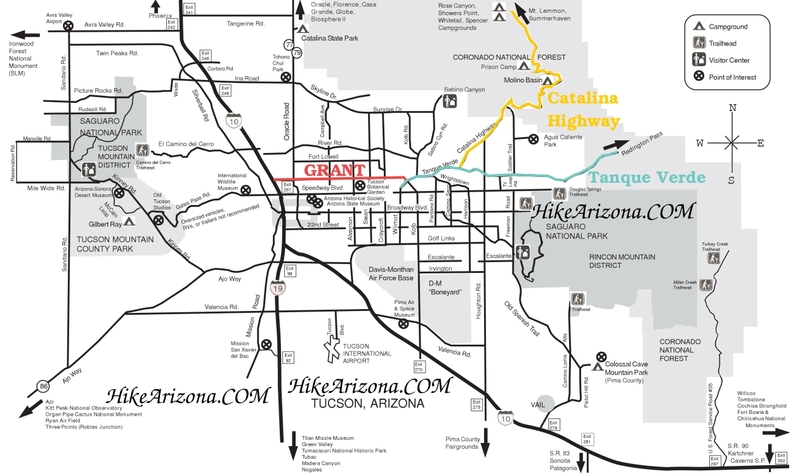 Access to the Gem trail is from the Golder Ranch Road Trail Head via the 50 Year Trail. This 1.2 mile trail starts at the triple Junction of the 50 Year Trail, 50 Year Upper Trail and the Gem Trail. This trail follows along a ridge that separates the Canada Del Oro Drainage from the Sutherland Drainage with views to the northwest overlooking Canada Del Oro, Town of Catalina and the Tortolita Mountains. This is another mountain bike trail so it is easy to follow. If you are looking for a connector trail from the upper 50 Year Trail to the northern end of The Chutes Trail this is it. This route also includes a spur trail that connects the 50 Year Trail to the midpoint of the Gem Trail. The high point on this trail is on the eastern end and it drops 400 feet to the Chutes on the western end. This is another trail that is not a destination but a means of getting to a destination. From Tucson take Hwy 77 (Oracle Road) to the town of Catalina. At Golder Ranch Road turn right. Follow Golder Ranch Road until it turns to dirt, go through the cattle guard, take an immediate left on E. Equestrian Trail. follow the dirt road for 0.6 miles turn right at the corral. Follow the 4WD road 0.7 miles to trailhead at corral and cattle guard.